RENDERING PROVIDED BY BERGMANN ASSOCIATES An artist rendering of the upcoming Midtown EATS event. The series kicks off Thursday along the Tower 280 pedestrian walkway. 11 a.m. to 1 p.m.; 4 p.m. to 9 p.m.
EDITOR'S NOTE: Due to inclement weather, the first Midtown EATS event has been postponed until Thursday, June 1. A new dining event is joining the summer lineup. The Midtown EATS series, a pop-up restaurant showcase, will feature local restaurants serving lunch and dinner in downtown's Midtown area. Set for the first Thursday of every month — with the inaugural event on Thursday, May 4 (rescheduled for June 1) — Midtown EATS will give Rochesterians an opportunity to sample the city's diverse edible offerings. 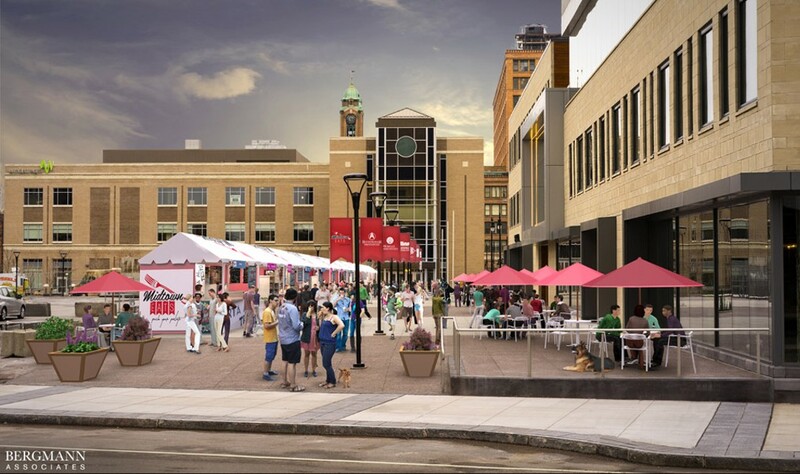 More than a dozen restaurants — including Branca, Blu Wolf Bistro, Tapas 177, Sticky Lips, and Itacate — will set up shop along the pedestrian walkway in front of Tower 280 on Broad Street, and will be offering lunch from 11 a.m. to 2 p.m. and dinner from 4 p.m. to 9 p.m. There will be seating for those who want to stay and linger, but all food will be available to go. Beer, wine, and cocktails will also be available during dinnertime. Midtown EATS is produced by the Springut Group, the same outfit behind the Lilac Festival and Park Avenue Summer Art Fest; the organization's president, Jeff Springut, has been intrigued by the concept of a restaurant pop-up series since seeing similar events in New York City and other cities. But it wasn't until Allie Sebastian of Morgan Management (which, along with Buckingham Properties, developed Tower 280) called Springut to propose the concept that things really got moving. Springut Group began soliciting restaurants in December 2016 and was met with enthusiasm — as Springut says, "No one said, 'That's not a good idea.'" For Springut, who himself worked for 30 years in the restaurant industry before going into event marketing, good food is the way to draw people to Midtown: "Food is the lowest common denominator," he says succinctly. The way Springut sees it, Midtown Rochester is right on the "cusp of success," and the pop-up series could be a "catalyst" toward further development. Having seen success with downtown residences, developers are keen on seeing more retail and restaurants in the area; several major developers, Springut says, have made contributions to launching Midtown EATS. Aside from its objective to draw more people downtown, Midtown EATS is also a way to celebrate the city's evolving food scene. The series encourages Rochesterians to branch out and try new things, and is using the slogan "push your palate." In turn, the monthly event also gives local chefs an experimental opportunity in which to prepare new or off-menu items with comparatively little risk. (Spoiler alert: expect cow tongue tacos). To that end, Springut Group has put together a lineup of local chefs and restaurants keen to show Rochesterians the breadth and depth of city's foodscape. One face you can expect to see is Kevin McCann, owner of McCann's Local Meats on Clinton Avenue in the South Wedge. Founded in 2015, McCann's has already received a positive response from Rochester carnivores. McCann believes the event will incentivize people to spend more time in Midtown and recognize the potential of the area, beyond simply a location for offices. He also hopes his presence at the event will encourage his already-loyal customers to patronize other local restaurants. When it comes to pushing palates, McCann says his business aims to "break the cycle of culinary apathy" by giving his customers a "flip-the-light-switch moment" with locally-sourced meats in a variety of cuts both familiar and uncommon. He'll be bringing those principles to the table on Thursday: for the first Midtown EATS, McCann's will be serving charcuterie plates, selections of cured and salted cold meats ideal for a (hopefully) warm day. For establishments already located in Midtown, the event will bring welcome foot traffic. Tony Colon, owner of Fuego Coffee Roasters (45 Euclid Street), practically in the shadow of Tower 280, says he's watched the development of Midtown happen in his business's front yard. He thinks Midtown EATS will be a sort of "test market" for chefs to decide if the downtown area can be profitable. Although Fuego is just a stone's throw from the Midtown pedestrian walkway, the coffee bar will be set up on the sidewalk with a batch of its cold-brewed coffee in tow. According to Springut, more restaurants are still signing on for both the first Midtown EATS and subsequent events throughout the summer. "We're not going begging for vendors," he says. Still, Springut tinges his optimism over Midtown EATS with a bit of cautious reserve. When asked if everything so far is going better than he thought it would, "Ask me May 5th," he says with a laugh.